From director Michael Bay (The Rock, Armageddon) and the production team of Don Simpson and Jerry Bruckheimer (Beverly Hills Cop, Top Gun) comes a thrill ride of explosive action from beginning to end. 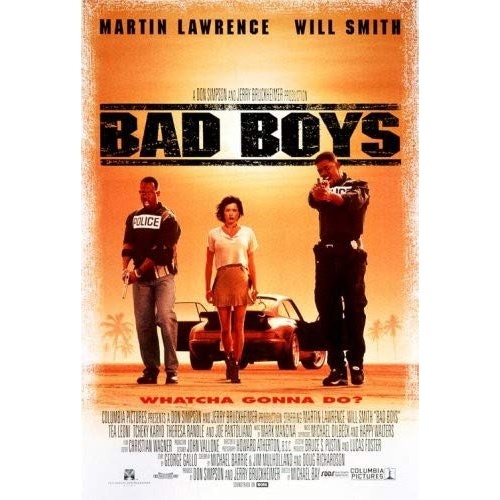 Will Smith and Martin Lawrence team up as partners in crime, crime-fighting that is, in this action-packed flick about a couple of good guys who are real Bad Boys! One hundred million dollars worth of confiscated heroin has just been jacked from police custody. Once the career bust of Detectives Mike Lowrey (Will Smith) and Marcus Burnett (Martin Lawrence), the missing drugs now threaten to shut down the narcotics division of the Miami Police Department. When the drug investigation turns deadly, the murderers kidnap the only witness - a beautiful police informant (Tea Leoni) and close friend of The Boys -- and things get personal! Fast cars, a gorgeous woman and non-stop action make Bad Boys a guaranteed good time!